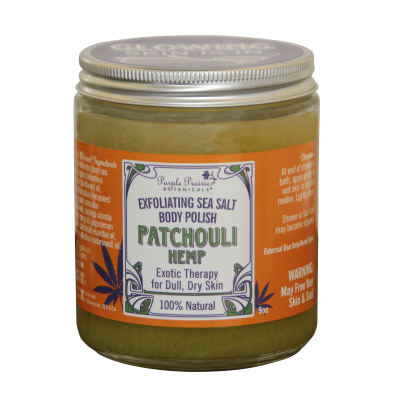 Exotic essential oils & Hemp team up to slough off skin ailments, deeply moisturize and give a sense of peace and well being. Organic olive oil, sunflower oil, hemp oil, pure essential oils and fine grain sea salt exfoliate and soften dry, dull skin. Directions: At end of shower or bath, apply gently to wet skin in circular motion. Lightly rinse. Shower or tub floor may become slippery. 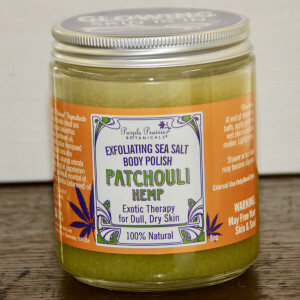 100% Natural Ingredients: Sodium chloride (dead sea salt), organic helianthus annuus (sunflower) oil, cannabis sativa (hempseed oil), organic cera alba (beeswax), cananga odorata (ylang ylang) oil, pogostemon cablin (patchouli) essential oil, cedrus atlantica (cedarwood) oil.